FINNLO rowing machines are convincing due to innovative technologies and high quality. More than 4000 enthusiastic users of the FINNLO rowing technology! With contemporary new innovations FINNLO is setting essential standards. Numerous patents and registered designs demonstrate the ability of FINNLO to adapt to the fitness market and respond to the needs of our customers. We especially attach importance to quality, ergonomics, innovation and the latest computer technology. The development of FINNLO rowing machines, beginning with the idea across the design up to the point of the prototype takes place at the company’s headquarters in Neu-Ulm. 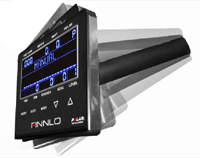 The high quality of our products, the accuracy, as well as the fully developed mechanics makes the rowing machines of the brand FINNLO unique and unbeatable. All FINNLO rowing machines have a ball-bearing comfort seat, which enables a comfortable seating position even with long rowing sequences. In addition, the seats have a height of about 50 cm, according to the seat height of professionals. As a result, not only the rowing on the water is simulated perfectly, but also makes it easier to get up and down. 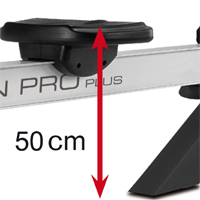 A special feature of FINNLO rowing machines is the ergonomically optimized step plate distance of only 9 cm. That minimal pedal distance is similar to the professional rowing boat and it is an absolute peak value. On top of this, you can adapt the step plates according to your shoe size. The FINNLO rowing machines are equipped with an aluminum rail, which has a length of up to 146 cm and a strap with a length up to 225 cm. In addition, the devices suit body sizes of 1.50 meters up to about 2 meters. One rowing machine can be flexibly used by young and old, big and small. The ball-bearing comfort seat slides noiselessly across the high quality aluminum rail. The FINNLO rowing machines are equipped with an extensive, clear and easy-to-use training computer. On an LCD display the training computer shows the various performance measures such as time required, distance, time per 500 meters, intensity, beats per minute, total strokes, heart rate or calorie consumption. In addition, various programs can be set. The computers have different pulse programs which allow the minimum and maximum heart rate to be set. Thus, a controlled and efficient training is achieved. So, the rower always trains in his best appropriate pulse area. In order to improve the level of performance the FINNLO rowing machines have various competition programs where you compete against the computer. This is not just fun, but motivates and pushes you in top form. The intensity can be adjusted between 30 and 300 watts. In addition, you can set certain wattage, so that you can train on one value independently of strength and pulling speed. The special feature of the computer is that it is continuously inclinable. That’s why the computer is always in view during workout, performance targets and pulse can be easily controlled. 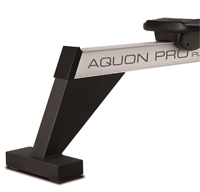 The extra long and adjustable monitor arm allows the perfect overview on the training data also for smaller people or people wearing glasses. 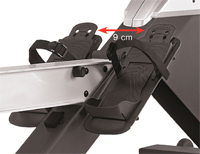 Another feature of the FINNLO rowing machines is the approved and FINNLO-typical combination technique of magnetic and air resistance. The advantages of air resistance and the magnetic resistance are combined for an optimal solution, and a durable liquid and smooth movement is generated. The air resistance contributes to a completely real rowing feeling: by pulling a wind wheel is driven, which increases the intensity as a function of pulling speed and pulling power. At the same time the trainee perceives the upcoming air vortex as a light and refreshing wind. In addition to the air resistance, a magnetic brake system is integrated. The magnetic brake allows a very precise setting of resistance with which high braking forces can be achieved also at low pulling speed. With this combination you can train varied and realistic at the same time. The FINNLO rowing handlebars are perfectly ergonomically adjusted to your hand. Even with intensive training sequences a non-slip grip is ensured. The special feature of the FINNLO Aquon Pro Plus rowing handles is that the desired resistance can be easily and quickly changed directly on the rowing handlebar. The extremely wide base makes the FINNLO rowing machines very stable. Mainly because of the crossbar that connects the base with the aluminum rail a high level of stability and security is assured.